Russia's Deputy Prime Minister Arkady Dvorkovich. Russia should focus on tapping new niches on the global market using new technologies, Deputy Prime Minister Arkady Dvorkovich said. 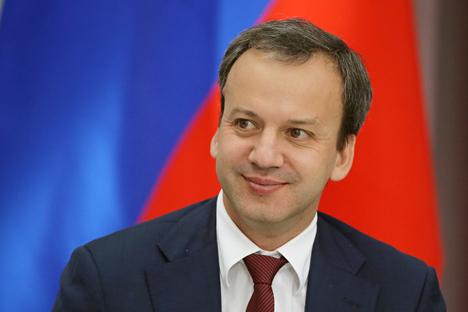 The Russian government is considering the possibility to change the country’s economy model within its economic support plan, Deputy Prime Minister Arkady Dvorkovich said in an interview aired by the Rossiya-24 TV news channel on Saturday. "We’re reviewing our [economic] model within preparation of the anti-crisis plan," he said. "The policy, plans, management system should be reviewed so that they might be aimed at a different development model, not directly tied with commodities revenues. We should focus on tapping new niches on the global market using new technologies. The ruble’s low exchange rate favors it," he said. According to the official, Russia’s Strategy 2030 should undergo public discussion. "We have agreed the Strategy 2030 should be a public document, rather than a kind of a government document. It should undergo broad public discussion and should be if not a consensus of opinion, then indeed be perceived positively by an overwhelming part of the society," the official said. The official also dwelled on the prospects of the global energy market saying oil prices of $60-70 per barrel are reasonable. "As for the current period, it is reasonable to consider a range of $60-70 per barrel, but it is achievable only in the new cycle of global economic growth and after the investment in the oil sector stabilizes at a new equilibrium level," the deputy prime minister said. "Prices may rise or fall within a wide range for certain periods of time: from 20 to 100 dollars per barrel," he added. Can latest government strategy lift the Russian economy?